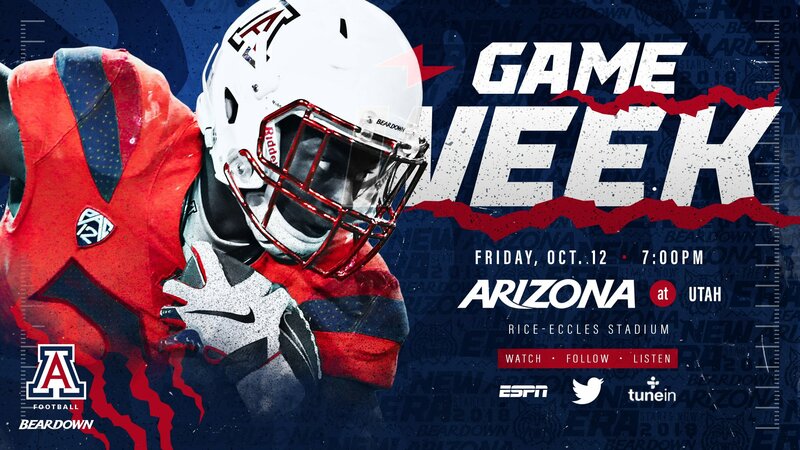 Arizona will travel to Rice-Eccles Stadium to take on the Utah Utes this Friday night. The Wildcats improved to 3-3 (2-1 Pac-12) on the season after defeating the California Golden Bears, 24-17, this past Saturday. Arizona did a great job for forcing California into committing turnovers and was able to secure the victory after a 24-yard interception return by Scottie Young Jr. gave the Wildcats a 24-14 lead with 3:13 left in regulation. Arizona’s offense was outgained by a 476-265 margin, however, the Wildcats were able to pick up the needed victory largely thanks to their defense that forced California into committing 4 turnovers including two pick-6’s. Utah snapped their 2-game losing streak and improved to 3-2 (1-2 Pac-12) on the season after a convincing 40-21 victory over the 14th ranked Stanford Cardinal this past Saturday. Utah burst out of the gates early in this one as they raced out to a 21-0 lead with 2:56 left in the 2nd quarter and although they did allow Stanford to make it a one possession game by the start of the 4th quarter, Utah pulled away by scoring 13 unanswered points to finish off the game. Utah was outgained by Stanford by a 423-421 margin however, won the turnover battle by a 4-0 margin. Leading the way for the Utes was RB Zach Moss who had 160 rushing yards and 2 TD’s on 20 carries. Utah is going to be a tough match-up for Arizona as they have the 18th ranked scoring defense. The Wildcats are going to have to be able to put points on the board in order to have a chance. Utah is currently a -14 points favorite. Let's talk about how you think the CATS will do against the Utes. I had this as a win in the preseason, but I think we can cover, not so sure we can win. A good team at their place. Not hate'n, Sumlin doesn't have his system in place yet. I predict we are going to have a hard time winning any road games this year. The first half team against USC we lose BAD! The second half team against USC we win! The first quarter team against Cal we could win. Our STs have been terrible. Our D is improving, but miles to go. It is deopendant upon our Offense to actually play 60 minutes of Arizona football. Oh, RR flashback. Also, I say this openly. The Utah QB is not liking pressure this year! See the USC QB, and the Cal QB, etc....and he is Turn Over prone. Hint? While they did beat Stanford, they also lost to WSU and Oregon. Would agree, however, this years version of UCLA could be a road win, they are perhaps even worse than OSU. The only chance we have is if a. both of these teams show, the Second half team from USC and the first have team from Cal, along with the defense from the second half against Cal. AND b. Utah does not show up. I am not holding out much hope, but will be watching from my living room praying for divine intervention. So you are saying there's a chance? Inform against Utah is Chrome Red helmet and all white Jersey and pants. BearDown!